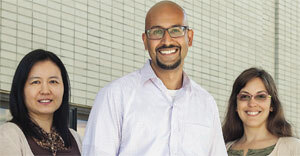 Make a direct impact on medical research with your year-end giving. These three worthy projects are just a few of those being conducted by the Taubman Institute’s Emerging Scholars – early-career medical school faculty who are practicing physicians AND research scientists. These high achievers are the thought leaders and breakthrough-finders of tomorrow, and our Emerging Scholars grants were created to accelerate their careers. Giving Blueday donations in any amount will be credited to these projects by December 31 with no administrative costs deducted. Your generosity, and their genius, will truly make a direct impact on the progress of medical research. Thank you for partnering with us, and best wishes for a happy and healthy 2018. 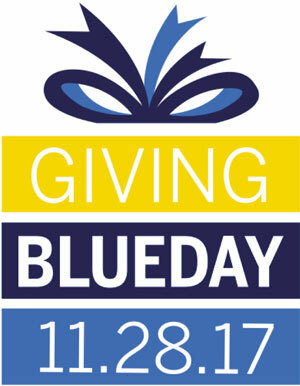 Click here to make your 2017 Giving Blueday donation now! Graft-versus-host disease (GVHD) is a major complication limiting successful blood and marrow transplantation for kids and adults with life threatening cancer. 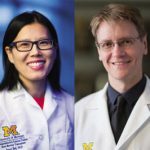 Dr Choi, a pediatric oncologist, and Dr. Gudjonsson, a dermatologist, are teaming up to examine gene patterns or pathways that may be involved in GVHD affecting the skin. Their goal is to identify new targets involved in skin GVHD, that may lead to novel prevention or treatment strategies, and thus better outcomes for patients with cancer. Funding from a 50-patient study at $100 per patient could deliver meaningful results in as little as one year, potentially leading to new knowledge about person-to-person transplantation. Dr. McLean specializes in the treatment of women’s cancers, and her research program focuses on ovarian cancer. To accelerate discovery, she aims to compile tissue samples from patients into a “tumor microarray” that will allow many cancer samples to be tested at a single time for reasons the disease developed, and to identify potential targets for medicines. Funding for 400 samples – at about $25 per sample – will allow for collaborative groundbreaking research within the Ovarian Cancer Initiative spearheaded by Dr. McLean. 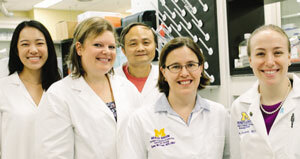 Read this Michigan Medicine article about Dr. McLean’s work. Dr. Sen researches the interactions between genes and the environment and their effect on stress, anxiety, and depression. His pioneering study uses data from a Fitbit activity tracker, a mobile phone app and DNA collection kits to monitor factors like physical activity, sleep, mood and biological changes in first-year medical interns — typically a highly stressed cohort. Developing a better understanding of how life stress leads to the onset of psychiatric disorders, such as major depression, may transform our ability to treat and even prevent these disorders. A $200 donation will cover costs for one subject in the Intern Health Study.